Recent releases of Monteverdi, Luigi Rossi, and the amazing “Mantovano Hebreo” Salamone Rossi. NOTE: This is the first of two programs looking at recent releases centering on the musical scene in Italy at the cusp of the Baroque. I. Memento mori (Les Cris de Paris/Geoffrey Jourdain). Aparte CD AP059. Created by Geoffroy Jourdain in 1999, Les Cris de Paris perform vocal and instrumental works from many eras, from the early sixteenth century to the present. The ensemble is currently in residence with the city hall of the fourth arrondissment of Paris and the Singer-Polignac Foundation, and each production brings together between four and eighty performers (singers, instrumentalists, actors, dancers) and also visual artists, theater and film directors, writers, choreographers. 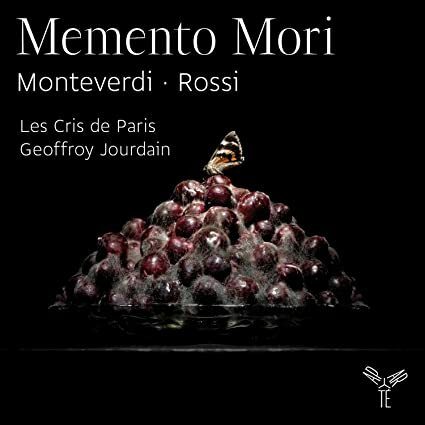 Memento Mori features works by Claudio Monteverdi (1567-1643) and Luigi Rossi (ca 1597-1653) on the theme of the Vanities. These 'moral cantatas', play on the 'affeti', ie they were used to heighten the devotional feelings of those attending sermons in Roman oratories, or prayer halls, in the early years of the 17th century. In these oratories were held informal meetings, or spiritual exercises, using the vernacular, Italian instead of Latin, and in which music became a significant factor in attracting participants. Those who commisioned such works [cardinals, popes, noble families] had long been aware of the attractive potential of secular genres. The ancient practices of laude, basso ostinato and lamenti, as well as popular new musical genres, including opera, which was developing, were able to flourish in the oratories as a vehicle for spiritual messages. The booklet essay raises doubts as to the attribution of these works to Rossi and supposes that they were probably written for a period of penance in the liturgical year, perhaps during Lent. In each of the works on this recording the alto vocal part usually taken by a contralto or falsetto voice, is performed by a tenor, a personal, rather than musicological choice taken by Geoffroy Jourdain. 3). Anon. (after MONTEVERDI Lamento d’Ariana): Lamento de la Maddelena. II. Claudio Monteverdi: Madrigals (Arcangelo/Jonathan Cohen). Hyperion CD CDA68019. 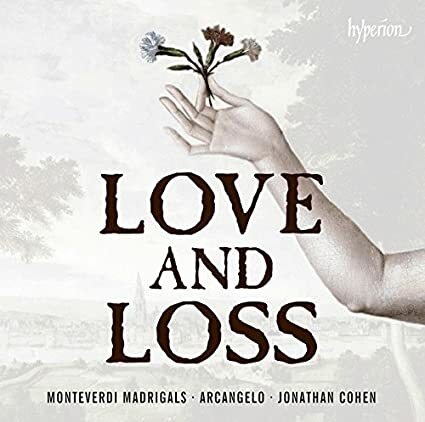 From Gramophone: The latest disc from Jonathan Cohen’s virtuoso ensemble Arcangelo is a musical love story, complete with lovers’ quarrel (a sword-battle to the death, no less), tearful partings and tragic endings. Bringing together the Sestinas from Books 6-8 of Monteverdi’s madrigals, the programme explores the gamut of the composer’s mature style, evolving from the crystallised 'prima prattica' perfection of Book 6 to the 'genere concitato' (agitated style) of Book 8. All of Cohen’s singers come from the world of opera, and it shows in performances that place the drama of 'le parole' to the fore. The astonishing harmonic flexibility and melodic narrative of Monteverdi’s writing translates here into urgent drama. You can’t turn away from the musical convulsions of Clorinda’s death (Combattimento di Tancredi e Clorinda, Book 8), nor doubt the simple agony of the lover in Book 6’s Sestina Lagrime d'amante al sepolcro dell'amata. If occasionally voices over-exert, strive a little too earnestly to make their case (tenors and sopranos both push hard through the chorus ‘Ei l’armi cinse’ from Volgendo il ciel) then it seems a fair trade for so vivid an aural staging. But among so much vocal athleticism, it’s still the instrumentalists of the ensemble that dominate, setting the disc apart from the excellent I Fagiolini recordings that come closest vocally to this kind of abandon. Sitting midway between the nervous energy of Alessandrini’s Concerto Italiano and the more measured intensity of Jordi Savall for the Book 8 works, Arcangelo’s musicians deploy rough-edged expressive risk-taking within a framework of complete stylistic control. The result is so exciting that Merula’s throwaway Ciaccona for violins and continuo—all quasi-improvisatory brilliance and fire—risks being the best thing here. Ohimè, dov’è il mio ben, dov’è il mio core? III. 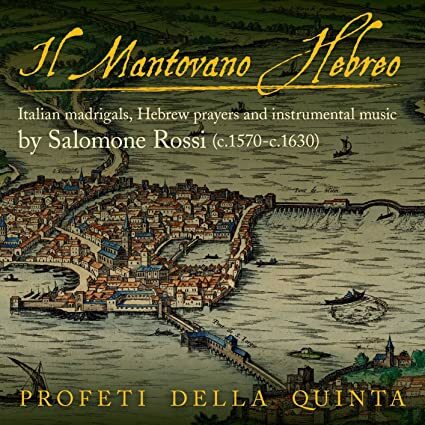 Il Mantovano hebreo: Italian Madrigals, Hebrew Prayers, and Instrumental music by Salomone Rossi (Profeti della Quinta). Linn CD CKD 429. The program encompasses Rossi's many-faceted talents both as a court composer in the service of the Gonzaga family and as a unique innovator of devotional music for the synagogue. The award-winning a-cappella ensemble, comprising five core male singers, is joined for this recording by Katya Polin and Eva Saladin (violin) and Ori Harmelin and Ryosuke Sakamoto (theorbo). The native Hebrew speaking singers specialize in the music of the Italian Baroque and have an immediate connection to Rossi as a Jewish Italian composer.